It can be tough trying to choose among several massage chairs and even tougher to pick between two of the best, such as the Human Touch Novo XT2 and the Luraco i7 Plus. 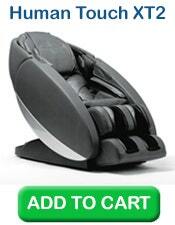 Both are top of the line massage chairs coming from two of the leading massage chair brands in the industry. In the battle between these two though, which one is the winner? By comparing their key features below, we're hoping we can give you a better idea of what each chair can offer you. The i7 Plus makes use of an S-Track system which follows the curvature of your spine closely. The XT2, on the other hand, uses both an S and L track. The L-track allows the massage coverage to extend from your neck and shoulders down to your glutes and thighs. The XT2 delivers a flex three-dimensional massage with five intensity settings. You can adjust them to make sure you get the pressure that's just right for you. The i7 Plus though boasts of having the most advanced and True 3D robotic system that is said to provide superb massage techniques for your lower back, neck, and shoulder. If you're looking for a captivating massage chair that is also space-saving, then the XT2 is the one for you. The chair can easily recline from its upright position with just 2” of space between itself and the wall. It is made with synthetic leather called Sofhyde which does not include any animal hide. In contrast, the i7 Plus is made with real genuine leather at all the touch surfaces (head, arms, shoulders, hips, and feet). The i7 Plus consists of 9 preset programs including Health, Soft, Quick, Morning, Night, Sport, Shiatsu, Stretch, and TV mode. 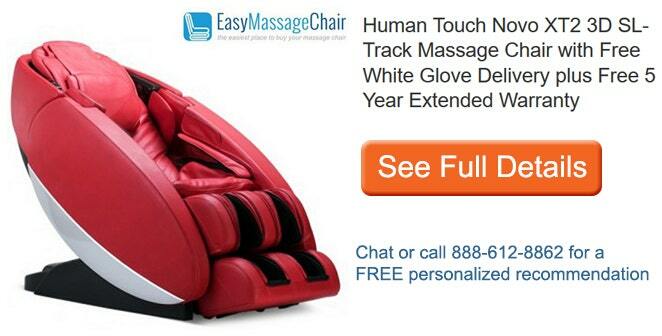 These can all be customized to pinpoint specific massage locations. On the other hand, the XT2 offers more in auto programs with a total of 35. This includes full body immersion, deep tissue and a collection of different therapeutic programs for relaxation and recovery. 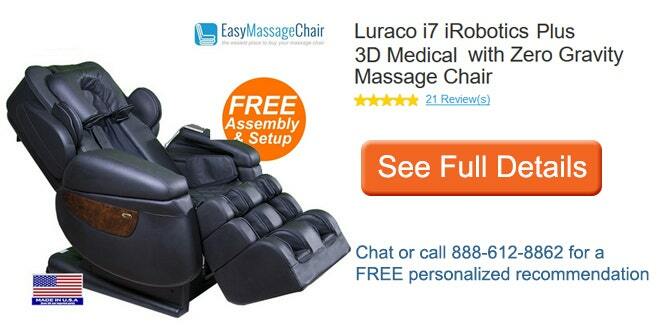 Both chairs offer the latest in Zero Gravity massage technologies. This neutral body position is the healthiest way to sit and receive a massage because it cradles your back, elevating your legs above your heart. Both chairs offer a unique and advanced body stretching technique. The Human Touch XT2 specifically uses an expansive "bend and stretch" technique that provides leg and spine relief. Both chairs also provide acupressure massage via the use of air cells, which apply pressure to key points and manipulate your body to stretch muscles. The i7 Plus uses 80 airbags while the XT2 only uses 36. Heat therapy is available in both chairs. However, the XT2 only has dual-lumbar heat to gently soothe your back, loosen tight muscles, and relieve you from pain. The i7 Plus offers a more comprehensive full body heat on your feet, seat, and back including 5 levels of intensity adjustments. The i7 Plus has an advanced three-layered calf and bottom foot massager with doubled rollers. The XT2 also does not disappoint with underfoot and calf rollers that have adjustable intensity for both calves and feet. The extendable leg rest even automatically adjusts according to your height. With the i7 Plus, you can enjoy Smartphone music streaming through its high-quality Bluetooth speakers. However, the XT2 boasts of an Altec Lansing Premium Sound System that you can use to charge your device, listen to music, watch videos or read an e-book. It even has a built-in Sound Sooth that provides immersive nature sounds as well as narrated demo walks of the chair's features and health benefits. You can manage the XT2's features using its intuitive navigation control which features a crystal-clear LCD screen. However, the i7 Plus has the industry's first touchscreen controller same as in Smartphones, making it easier for you to operate the chair. The XT2 has a downloadable app for your Android or IOS device that can be used to control your chair. However, the i7 Plus has a human voice response setting in 7 languages and it has optional health monitoring features that measure blood pressure and heart rates. The Novo XT2 is available in black, red, gray, cream or espresso colors and sells for $ 8,499.99. The Luraco i7 Plus, on the other hand, costs more at $8,990.00. It comes in black, brown or cream colors. Both comes with FREE white glove delivery and 5 years warranty. No matter which one between the Human Touch Novo XT2 and the Luraco i7 Plus you end up choosing, you will not be disappointed. 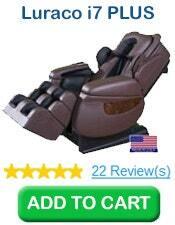 It's a win-win situation because they are two of the best massage chairs in the industry. It all boils down to your preference. Once you decide on your choice, let us know by calling us at 1-888-612-8862.